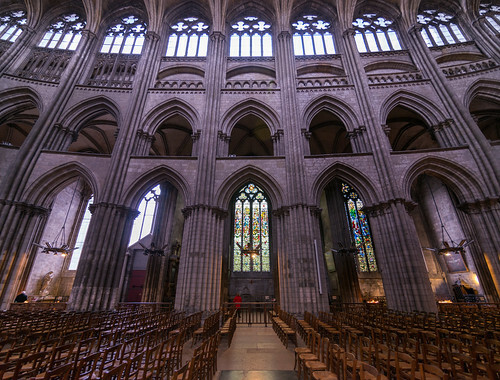 Rouen Cathedral (Cathédrale primatiale Notre-Dame de l'Assomption de Rouen) is a Roman Catholic Gothic cathedral in Rouen, Normandy, France. All the buildings perished during a Viking raid in the 9th century. Construction on the current building began in the 12th century in Early Gothic style for Saint Romain's tower, front side porches and part of the nave. The cathedral was burnt in 1200. Others were built in High Gothic style for the mainworks: nave, transept, choir and first floor of the lantern tower in the 13th century; side chapels, lady chapel and side doorways in the 14th century. Some windows are still decorated with stained glass of the 13th century, famous because of a special cobalt blue colour, known as "the blue from Chartres". The north transept end commenced in 1280. The realisation of the Butter Tower caused disturbances in the façade, which caused the reconstruction of the central portal and the west front, which begun in 1509 and finished in 1530. The original Gothic spire suffered a fire in 1514, nevertheless the project of a stone spire was denied and a wooden construction covered with gold-plated lead was begun in 1515, a parapet was added in 1580. In the late 16th century the cathedral was badly damaged during the French Wars of Religion: the Calvinists damaged much of the furniture, tombs, stained-glass windows and statuary. The cathedral was again struck by lightning in 1625 and 1642, then damaged by a hurricane in 1683, the wood-work of the choir burnt in 1727 and the bell broke in 1786. In the 18th century, the state (government) nationalised the building and sold some of its furniture and statues to make money and the chapel fences were melted down to make guns to support the wars of the French Republic.